EVERETT, Wash., Feb. 25, 2014 /PRNewswire/ -- Boeing [NYSE: BA] today delivered the first 777-300ER (Extended Range) to China Southern Airlines, Asia's largest airline in fleet size and number of passengers carried. 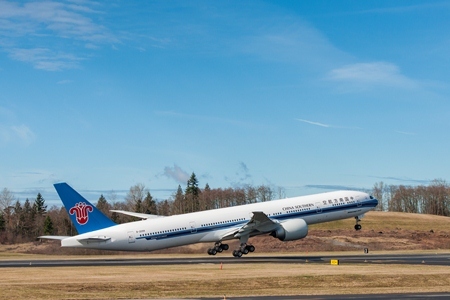 Pictured here is China Southern’s first 777-300ER as it takes-off from Paine Field in Everett, Wash.
EVERETT, Wash., Feb. 25, 2014 /PRNewswire/ -- Boeing [NYSE: BA] today delivered the first 777-300ER (Extended Range) to China Southern Airlines, Asia's largest airline in fleet size and number of passengers carried. The new airplane is the first of 10 777-300ERs China Southern has on order with Boeing. "The 777-300ER's long-haul capability is a perfect fit for our network expansion plans as it will enable us serve our existing long-range markets more efficiently and open new routes in the future," said Zhang Zifang, Chief Operating Officer, China Southern Airlines. "The 777-300ER will support the development of Guangzhou as our main international hub and will be a vital part of our 'Canton Route' services." China Southern plans to operate its first 777-300ER on its new North America route, where it will be able to directly connect passengers in the southern region of China to the eastern coast of the United States. "We are honored to play a part in China Southern's growing success and proud to celebrate this milestone together," said Ihssane Mounir, senior vice president of Sales and Marketing for Northeast Asia, Boeing Commercial Airplanes. "The 777-300ER is a great choice for China Southern. Its combination of efficiency, industry-leading reliability and award-winning cabin design will continue to help China Southern generate more revenue and provide a superior passenger experience." China Southern has configured its new 777-300ER to feature four distinct cabins. On board passengers will find four first class seats, 34 business class seats, 44 premium economy seats and 227 economy seats, for a total of 309 passengers. The Boeing 777 is the world's most successful twin-engine, long-haul airplane. The 777-300ER extends the 777 family's span of capabilities, bringing twin-engine efficiency and reliability to the long-range market. The airplane can fly up to 7,825 nautical miles (14,490 kilometers) and is equipped with GE90-115B engines, the world's most powerful commercial jet engine. China Southern Airlines, based in Guangzhou, has been a valued Boeing customer for 25 years. In 2013, China Southern was the first Chinese carrier to operate 787 Dreamliner. The airline was the first carrier in Asia to operate the 777 in 1995 and the first to operate 777s on nonstop routes across the Pacific Ocean, connecting Guangzhou and Los Angeles. China Southern was the first Chinese carrier to take direct delivery of the 757-200, 777-200, 777-200ER (Extended Range), 777 Freighter and 747-400 Freighter from Boeing.